NORRIDGEWOCK -- Firefighter James Gordon has been visiting older folks in town dressed in a Santa suit for the past 25 years. He was back at it on Saturday, arriving with his helpers in a fire truck, bringing candy and season's greetings to more than 150 people all over town. NORRIDGEWOCK — Firefighter James Gordon has been visiting older folks in town dressed in a Santa suit for the past 25 years. He was back at it on Saturday, arriving with his helpers in a fire truck, bringing candy and season’s greetings to more than 150 people all over town. At the Fairmont Circle Drive housing community off Sophie May Lane, Gordon pulled up at around 10 a.m. with Christmas music playing from two speakers mounted on the truck. 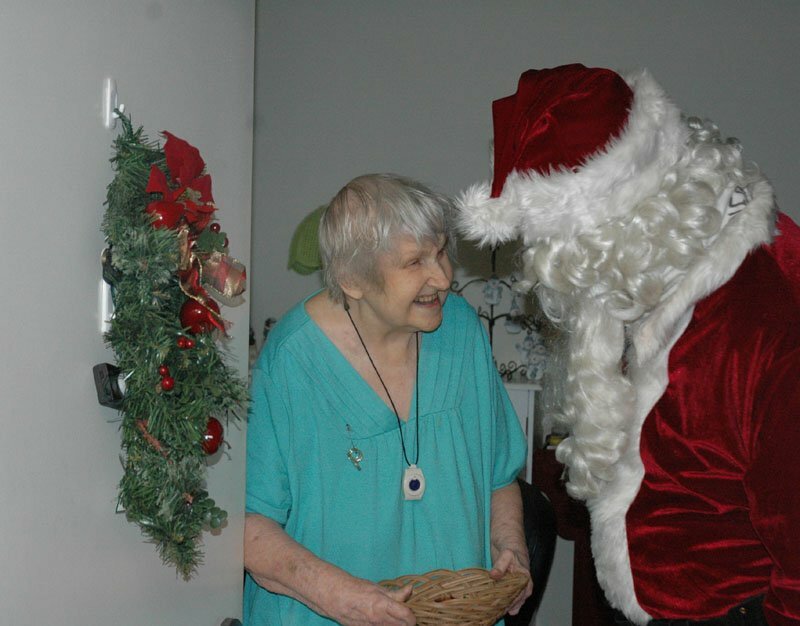 At the women’s residences, Santa walked in with a loud “Ho, ho, ho” asking all the ladies if they had been good this year. When asked the same question, Tracy’s neighbor Evelyn Wright said “ah … about half and half”. Santa brought them all Haviland chocolate-covered thin mints, nicely wrapped by his wife Pamela with a tag from the Norridgewock Fireman’s Association. Joining the jolly old elf for his rounds on Saturday were Norridgewock firefighters Alan and Dennis Obert, along with Gordon’s grandson Hunter Allen. Gordon, a 27-year veteran of the Norridgewock Fire Department, said he and his helpers used to visit children, as well, but when all the other Santas started showing up in stores, he said they decided to concentrate on older people in town. “It got to the point where every store had a Santa Claus, so we kind of cut that out and we just went with seniors,” he said. “We have a route all through the town and we know where most everybody is and we just go house to house.